US President Donald Trump has launched an extraordinary attack on a female news anchor's alleged plastic surgery. He said MSNBC host Mika Brzezinski was "bleeding badly from a face-lift" during a visit to his Florida golf resort Mar-a-Lago. In a Twitter salvo, Mr Trump also assailed Brzezinski's MSNBC co-presenter Joe Scarborough. They are both his occasional sparring partners and she this week accused him of developing a "dictatorship". "I heard poorly rated @Morning_Joe speaks badly of me (don't watch anymore)," Mr Trump tweeted on Thursday morning. He also accused "low I.Q. Crazy Mika" and "Psycho Joe" of "insisting on joining me" at Mar-a-Lago over three days at New Year's Eve. "She was bleeding badly from a face-lift. I said no!" he added. Amid an outpouring of criticism from left and right, the White House rejected suggestions Mr Trump had done anything wrong. "The president has been attacked mercilessly on personal accounts by members on that programme," deputy press secretary Sarah Huckabee Sanders told a news briefing. "And I think he's been very clear that when he gets attacked he's going to hit back. "The American people elected someone who's tough, who's smart and who's a fighter. "And that's Donald Trump. And I don't think that's a surprise to anybody that he fights fire with fire." 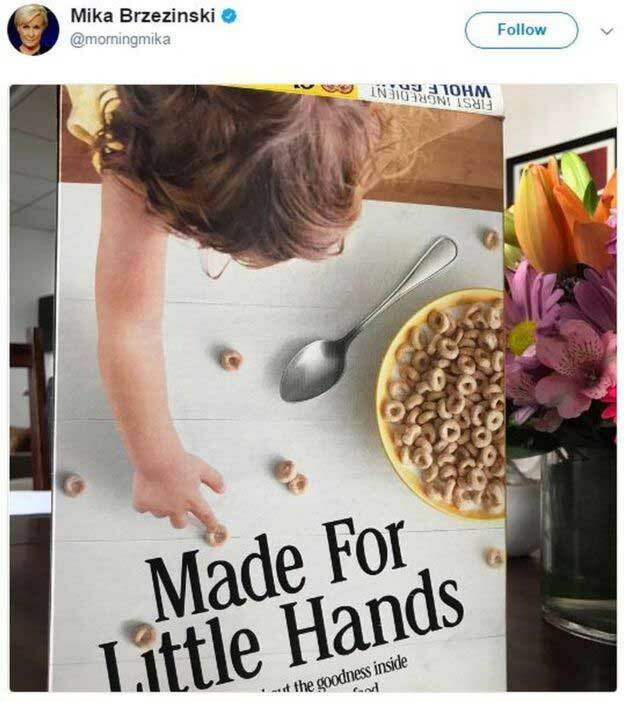 Brzezinksi, 50, hit back earlier by tweeting an advert for a children's cereal, with the caption, "made for small hands", an apparent reference to a taunt often directed at Mr Trump by his critics. During his presidential campaign, Mr Trump was a frequent guest on MSNBC's Morning Joe programme, which was accused by liberal voices of giving him preferential treatment. But the relationship turned sour as the presenters sharpened their scrutiny of the candidate. The pair have stepped up their attacks since Mr Trump's inauguration, deriding him as a "fake president". In recent weeks, Scarborough has called Mr Trump a "bumbling dope", resembling "a kid who pooped in his pants", while Brzezinksi has mocked members of the administration as "lobotomised". Mr Trump's latest broadside comes just a month after Scarborough and Brzezinski, who are engaged to one another, told Vanity Fair magazine the president had offered to officiate at their wedding. She is the daughter of the late Zbigniew Brzezinski, who was an aide to Presidents Carter and Johnson, while Scarborough is a former Republican congressman.